Clients who have developed overcompensating modes require a different approach from therapists in treatment. It’s very important that clients can trust a therapist not to judge them for having these modes and for a therapist to interact with these modes as part of limited reparenting. In this article we provide you with tools to handle overcompensating modes and hope to inspire to work with these challenging clients. The most common overcompensating modes are the Self- aggrandizer, Angry protector, bully and attack, perfectionistic over controller, paranoid over controller, attention seeker, predator and deceiving manipulator. Overcompensating as a coping strategy can feel like a very reliable and very successful strategy for clients. Most clients experience a very definite sense of control, power or accomplishment when they are in these modes. When they come to therapy it is usually not with the intention to change these modes but to find a way to feel less vulnerable. The downside is that these coping modes are in the way of dealing with the underlying schemas. Clients who seek help have a very understandable logical assumption that therapy is supposed to make them feel better. It’s therefore is a difficult job for a therapist to build trust while working on the client giving up coping that seems to make them feel strong and in control in order to help them deal with feeling more vulnerable and in touch with their feelings. The next problem a therapist faces is that these modes will come up within the interpersonal relationship you and your client engage in or within interpersonal relationships among different clients within a group setting. Most therapists want to keep a good working relationship with their clients and setting limits and empathic confrontation can make you feel like you’re putting the relationship at risk. We have found that certain guidelines can help therapists keep the therapeutic alliance and provide clients with overcompensating modes the safety they need to give up these modes and to deal with their underlying schema’s. Different therapeutic strategies are essential for handling overcompensating modes. Good pre-therapy work including a sound case-conceptualisation, setting the stage, a focus on needs, connection and limit settting. 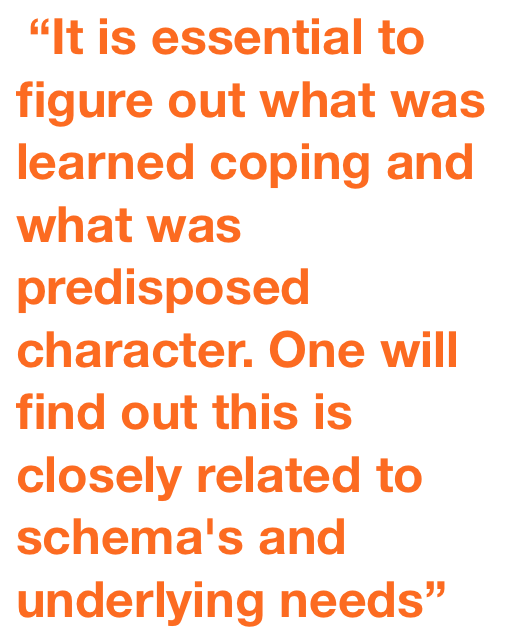 A case-conceptualization is essential for performing schema therapy in general. In patients with over-compensating modes it is even more essential to be one step ahead of trouble. Overcompensating modes are innate, learned or a combination of the two. To recreate a sound learning history and case-conceptualization it is essential to figure out what was learned coping and what was predisposed character. One will find out this is closely related to schema's and underlying needs. An innate impulsive child with a scheme lack of self-control and discipline has a need for realistic boundaries and guidance, while a child that developed the same schema upon an abandonment and instability scheme has a need for predictability and stability. Even though in therapy at first the strategy might be the same, focusing on safety and connection, depending on the primary underlying need the approach for handling the overcompensating mode is different and your expectation of when the schema will get triggered will also differ. Chances are patients with an innate tendency for impulsivity will respond to any kind of stress with impulsive behavior and will surrender to the schema either in an impulsive child mode or when in danger in a Bully and attack mode. The primary unfulfilled need are realistic boundaries and safety. Patients where undisciplined behavior is primarily a way of coping with stressful situations will have clear triggers to when they fall into such behavior. The triggers then are related to the primairy schema's and the underlying unfulfilled needs. One wants to make a sound case-conceptualization to predict the appearances of overcompensating modes and also to make a stern mode-management plan. In a group setting the group rules should indicate which behavior will be stopped by the therapist and why. The mode-management plan should have a time-out strategy for openly aggressive behavior, which is not the same as expressing anger. It is a vital part of psychoeducation to explain the difference between feeling anger, expressing anger and what is aggressive behavior. It is essential especially in patients with overcompensating modes, withrisk-seeking and live-threatening behavior to have a clear understanding of this behavior and how you as a therapist will handle this behavior when it occurs and how you and tour client can work together on this. Of course this plan might need adjustments after the first, or maybe the first couple of incidents. This is what we call setting the stage. If the therapist provides psychoeducation about limit setting as being a core need for children then setting limits later on is understandable for clients. It is key that the client understands that the therapist will set limits on these modes, without judgement, as part of limited Reparenting. The therapist takes responsibility to stop the behavior. The therapist gives support and guidance until the client can do it on his own. A focus on needs is at the core of schema therapy. However many therapist have trouble seeing the needs of aggressive, bullying clients. Overcompensating modes have the same goal as avoiding or surrendering modes, to protect the vulnerable child. Their needs where not met, therefor they respond with overcompensation. It is key not to judge a client for his modes and stop them respectfully but firm. It is also very important not to move towards the vulnerable child too quickly. Some therapists see the vulnerable child behind any coping mode. It of course is there, but when moving over to soothing or support while in fact an overcompensating mode is active, will reward the client for this behavior and block change. Only move to the vulnerable child when the client is actually in the vulnerable child mode, not when you feel it must be there. Overcompensating modes, as all other protector modes have to be valued for all the work they have done to protect the vulnerable child. However, be clear their work is done and it is not helpful at this time. Pro's and con's list can be used to sort out what need is necessary to be met and if the mode is helping in the present time. The client has to understand he can always put his protector jacket back on when it is really necessary but now it is not. Especially when handling overcompensating modes it is key to get to the need as soon as possible. For this reason one has to have the learning history memorized. Naming the underlying need, helps the client with mistrust issues when the therapist sets limits. In order for clients to recognise the underlying vulnerability behind this coping mechanism they first need be stopped when they are in their overcompensating modes. 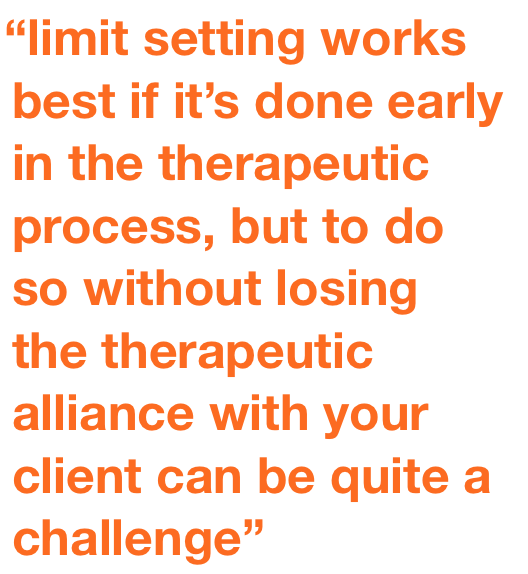 It is our clinical observation that this limit setting works best if it’s done early in the therapeutic process, but to do so without losing your therapeutic alliance with your client can be quite a challenge. In patients with overcompensating behavior one wants to be ahead of the problem. However of course this is not always possible. In general it is essential to be aware of triggers and behaviors that lead up to, or indicate upcoming overcompensating behavior. In a group, but also individually, one can stop the behavior with small non-verbal gestures like a knot or a hand wave. Also small words like ‘girls…’ can help to calm things down before it gets out of hand. When starting an verbal intervention it is essential to be transparent about what you are doing; ‘I am stopping you for a moment because I can see you areheating up’. It at first can help to suggest what bodily or other posterior signs you see to help the patient become aware of physical signals preceding or coinciding with overcompensating behavior. Ask questions like: can you feel this too? When did you feel it starting? Do you know what set it off? Does this feeling belong to a certain mode? Remember we agreed you can be angry, but it is not allowed to throw things. I know from your history you got triggered by something I said or did. I cannot help you or listen to you when you show aggressive behavior. Follow your mode management plan and step out into the hall way, count to ten and step back in when you feel we can proceed without the aggressive outburst. Use behavioral suggestions to guide new behavior. Things like can you sit down? You are allowed to walk through my room if it helps you focus and calm down and I can sit in my chair calmly and safely (of course check you feel safe).Or you can leave the room if you can not control your aggression, and then we will talk about it afterwards when you are calm. Use cognitive interventions when the overcompensating mode popped-up expectantly after you stopped the action; ‘You surprise me with this mode just now, do you understand why it popped-up? Let’s look in to that using a mode diary’. When consequences are installed for crossing limits, make sure the limits are realistic and held on to. When the consequence is in place, do not lift the consequence when good behavior is shown. Reward the good behavior differently, with words or tokens. When limit setting, keep the connection with the patient by focusing on the learning history and the needs: I know you were often not heard and set aside and you probably expect me to do the same. I however really want to hear your point of view. Please tell me what you feel. It helps me if you can lower your voice a little so I can really listen carefully. When people really crossed boundaries, make sure they apologize and/or take responsibility for it before moving on. It is key patients take responsibility for their behaviors and the effect they have on others. Schema therapy in patients with overcompensating modes in fact is schema therapy. A therapist has to be aware of his own schema’s and trigger points and has to be aware of his own feelings of safety. Then when following the above written guidelines, the vulnerable child can be reached and healed and the healthy adult will grow.